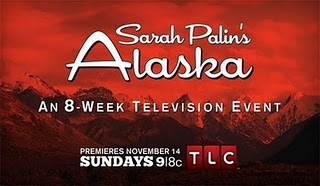 The longest and best-produced political campaign infomercial in TV history, Sarah Palin’s Alaska is (contrary to the avowed purpose of it) unabashedly in the service of promoting its star, the former governor of Alaska. You may well ask: promoting her for what? Nowhere during the first episode of the program does Palin state she is running for president (or anything else) in 2012. No, Palin is a good example of the modern phenomenon of free-floating candidacy, in which promotion of the self exists outside of a specific goal. It’s one of the many ways politics has merged with Hollywood, where a star can maintain a high profile and influence without actually appearing in any good or successful projects. This is why her critics were so laughably wrong when they declared her career over on the day she awkwardly resigned from the governorship. Palin understands this stuff perfectly, and apparently intuitively. Having reached a certain level of prominence, the governing of a state became utterly irrelevant to the larger project—not just irrelevant, but a drain away from the big picture. The surprising thing about Sarah Palin’s Alaska is that, even with this in mind, the first episode is barely underway before the political slaps arrive. Palin and her husband point out that writer Joe McGinniss has moved in next door and ruined their summer (filmed from afar sitting on his porch, McGinniss’s face is blurred out, as though he were a sexual predator on a reality crime show; this is done because he presumably didn’t sign a release form for the production company, but that’s not how it reads). Sarah doesn’t miss a chance to note that the fence extension her husband and his friends have built between properties is a metaphor for how we might keep out illegal immigrants. Or no, she doesn’t say this, quite; she says, “Others might look at it and say, ‘This is what we need on our nation’s border. '” Note the avoidance of owning this as her opinion and the use of a favored construction of political discourse: “Americans are tired of Obamacare and taxes on small business and Democrats who use infants in human sacrifice.” It’s not just my opinion—Americans factually feel these things, and the more times I say this, the more you are accustomed to accepting it as truth. But wait. Apparently it’s not easy to observe that irony. Not for forty percent of the country, anyway. We’ve had a few decades now with irony and satire and sarcasm in the ascendency, and it hasn’t made a spot of difference to the forty percent that thinks Sarah Palin is a terrifically refreshing and feisty gal who represents family values while traveling around the country to soak up the spotlight and millions of dollars in fees (do all the kids travel with her all the time, or is the mama grizzly away from the den a whole lot)? Forty percent of the country does not see a contradiction in Palin’s energetic flaunting of her children and her schoolmarmy wrist-slappings toward those who would mention this reality, as when David Letterman made an actually quite funny joke that referred to her daughter’s out-of-wedlock pregnancy. But to understand such a joke would require an understanding of—all right, I’ll let it go. The TV show has the kids, or some of them (it’s almost impossible to get a fix on how many of them there are), and Sarah going fishing near a bear enclave, and Sarah going rock-climbing. She reminds us that these rough Alaskan adventures, even if undertaken with expensive equipment and a full camera crew nearby, are the stuff of character-building, and we could all learn lessons from the wild. Yet they actually look like the actions of someone irresponsibly trying things they probably shouldn’t be doing without more preparation and training. In the political world, this means you end up looking glassy-eyed when Katie Couric asks you what newspapers you read; in nature, it means you end up dying alone in an abandoned bus in an Alaskan summer. The remarkable thing is that Palin has made advantages out of even her Couric moments. And however goofy or stomach-turning her TV series might be, there’s surely no downside in it for her. People know what they like, and they like this. Addendum: Just watched Episode #2. All right, possibly some downside. Palin’s repeated descriptions of the dangers of live halibut inflicting bodily harm carry a faint echo of Jimmy Carter’s brush with a killer rabbit. Plus, after watching her enthusiastically club the fish to death, it is nerve-wracking to see her enter the proximity of whales and otters – nothing seems safe in the lady’s orbit. Strangely, though, as the show goes on the brief but frequent glimpses of Palin’s own fears and anxieties make you suspect that her loud saber-rattling is an enormous act of over-compensating. Peter Brunette. A word here to mark the passing of someone I never met. In person, that is; I knew Peter Brunette through cyber broadcasts we made in the mid-1990s for the original, pioneering version of Film.com (today I guess these would be called podcasts), and his avuncular voice was always a pleasure to hear. (Among other qualities, the man knew how to pronounce the term chef-d’oeuvre, which he dropped – somehow not pretentiously – a few times.) An academic who wanted to write outside the jargon chamber, Peter wrote books about Italian cinema and Wong Kar Wai and also reviewed for the Hollywood Reporter, a cheekily broad spectrum. I owe him, because he got me to do the Billy Wilder volume in the University Press of Mississippi’s “Interviews with Film Directors” series, of which he was the General Editor. Toy Story 3. Everybody loves Pixar. But that shouldn’t stop us from understanding how exceptional they really are. Toy Story 3 is not up to the level of the previous films in that series; it dawdles at first, as though aware of how much goodwill its audience already has for it. But then it gets good, and for a while it gets great, and in a sequence (without doing too much of a spoiler) that involves the city dump, it gets devastating and stays that way through the end. The climactic moments of the landfill sequence are about death, and about recognizing it and accepting it. The scene is superbly “shot” and paced so as to deliberately pause the movie on the edge of the abyss, in a way that recalls some of the greatest movies ever made. And it’s about cartoon toys. This is a kind of wizardry that goes far beyond technical prowess. But then you already knew that about Pixar, which has so frequently examined the various stops along the way on the life cycle, including the final station. As the days went on and BP kept failing to contain the Gulf oil spill, the disaster’s cinematic predecessor became all too obvious: every monster movie in which a man-made accident spawned an (almost) unstoppable creature. (The “almost” part of the BP spill remains to be seen.) 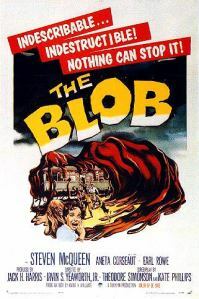 From giant ants in the Southwest desert to Godzilla to the Blob, the stages of the scenario in those movies (official fumbling, attempts at cover-up, initial efforts involving Army men with guns, then the heavy artillery that falls uselessly to the ground, and finally crackpot schemes that at least look sort of cool) are a prediction of the BP catastrophe and its slow-winding aftermath, complete with helpless public looking on from the sidelines. The Army men with guns will have to be taken as a metaphor, but you get the idea. Especially important, in both fiction and reality, are the men of business/science who failed to plan an adequate exit strategy. The centenary celebrations for Whit Bissell are winding down by now; you’re probably tired of hearing the endless tributes and thinkpieces paying tribute to the actor, born October 25, 1909. Of course I’m kidding: nobody pays elaborate, passionate tribute to Whit Bissell, and if people know his name it’s because of its humorous quality, an internal rhyme contained within a tiny, meek-sounding series of syllables – a name for a soda jerk or a vacuum cleaner salesman. Still, a tribute. Whit Bissell might have been the first actor I could recognize as a character actor, a guy who turned up everywhere but rarely played leads. He has almost 300 credits listed on the Internet Movie Database, yet his actual total is surely higher than that when you factor in his ubiquitous TV appearances and uncredited movie work. But character actors are supposed to be colorful in some way: zany or grotesque, not cut out to be heroes but carrying some distinctive quality. 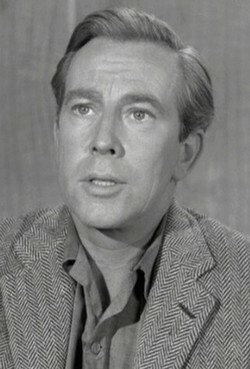 Whit Bissell was like his name: he tended to white himself out. Even other people on screen looked bored by him sometimes. A compact fellow, evidently prematurely white-haired, Bissell had a slightly severe face and a forceful voice, and thus played a lot of doctors and professors and figures of authority. I must have first known him as the military supervisor on The Time Tunnel, where (as he so often did) he fretted and crunched numbers and supplied a drag on the proceedings. He was on all the TV shows in the 1960s and 70s, including the “Trouble with Tribbles” episode of Star Trek, and stayed in movies, too, so often turning up for his one good scene or tiny fragment of story: The Magnificent Seven, The Manchurian Candidate, Hud. Before he switched to TV-mostly work, Bissell did lots of differents parts, and it would be wrong to suggest that he always played the same drab, officious role, even if a lot of his stuff blends together; especially early on, he got to play neurotics, and his pinched face made his authority figures available to be untrustworthy at times. Good roles in Brute Force, Raw Deal, and He Walked by Night put him in the noir world as a sometimes sweaty, nervous type; he could bring on the badness, as in Riot in Cell Block 11. When it came time to essay a member of the crazed Frankenstein family tree, in I Was a Teenage Frankenstein, he turned in a typically professional, steady performance, perhaps the least histrionic Dr. Frankenstein ever (despite the florid plot turns and dialogue). 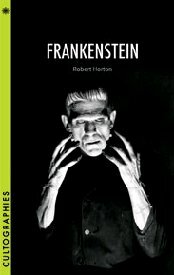 He was repeating his duties there, more or less, from I Was a Teenage Werewolf, and he did a lot of genre work during that era, which is another reason I came to know him so well when I was an adolescent: Creature from the Black Lagoon and Monster on the Campus are among the best of those. And when a framing story had to be added to Invasion of the Body Snatchers to re-assure the audience that the alien takeover wasn’t really coming to their town, of course it was Whit Bissell cast as the authority figure calming down Kevin McCarthy. I always enjoyed seeing him during this time, but my affection increased after I realized his name was Whit Bissell, that funny moniker that might have come from Mark Twain. How can you not like a guy named Whit Bissell? People like him make movies go. You say, “Ah, there’s Whit Bissell,” and then he’s gone, off to pop up in something else in a few minutes on a different channel, then bound for some retro-TV station showing Wagon Train or Perry Mason or Mannix. In a hundred more years, he’ll still be doing that. Even the quietest character actor makes his permanent place. 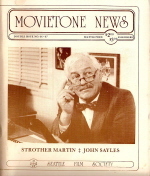 I first pored over old issues of Movietone News in the periodical racks at the University of Washington library, completely taken with its short reviews and meaty longer pieces. A couple of years later I was writing for MTN, much to my astonishment (my first real, honest-to-Jehovah published movie review was a skeptical short take on Star Trek–The Motion Picture). Seeing my name listed on the Movietone masthead for the first time as a “Contributing Writer” was one of the very large moments in my young life. But even if I hadn’t ended up writing for the magazine, I would cherish its movie literacy, its film-for-film’s-sake approach, and its slightly hothouse sense of being a haven for personal critical voices. Parallax View instigator Sean Axmaker, with Jameson’s approval and participation, is rolling out the MTN back issues in reverse order; thus the final issue is on deck first. An intro page is here. The longer pieces in this issue include a warm conversation with that splendid character actor Strother Martin, and a quite wonderful “interview” with John Sayles–actually a long transcription of an appearance by Sayles before a U of W screenwriting class in 1980, around the time Return of the Secaucus Seven had come out (I was in that quarter-long class, which also featured appearances by Jonathan Demme and the Airplane! guys; the ambitious undertaking had been co-organized by Jeff Dowd, the irrepressible publicist who would later gain fame as “The Dude,” the real-life basis for the Coen brothers’ Lebowskian fiction). 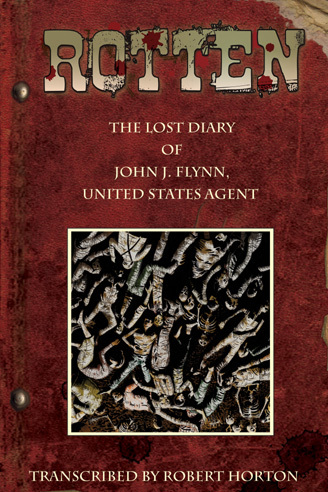 PDFs of the original magazine are also clickable as you read through the Parallax postings. When Parallax reels the magazine back into the 1970s, I think people will newly appreciate the richness of this amazing magazine, which deserves its place in any account of the glory years of American film criticism. Welcome back, Movietone News. The special awards at the Oscars are a chance to reward worthy careers and correct huge oversights (Cary Grant and Alfred Hitchcock had to wait for Specials to get their hands on statuettes, inexcusable lapses that help explain Hitchcock’s snippy two-word acceptance speech: “Thank you”). The 2010 ceremony, continuing its spirit of abundance – 10 nominees for Best Picture – will fork over three Honorary Oscars and the Irving Thalberg award, the latter given out specifically to producers. I can’t really explain why I am mildly obsessed with the Honorary Oscars, except for the general sense of righting past wrongs and affording an opportunity for the ceremony to pause for a few minutes to pay tribute to someone older than Megan Fox. The actual tribute gets shorter every year, and for a long time the tribute clips have been poorly chosen. (The Blake Edwards tribute was a bare-bones montage of sight gags, redeemed by Edwards’ own appearance: a piece of slapstick involving a motorized wheelchair.) For 2010, the honoraries will be handed out before Oscar night, at the “inaugural Governor’s Awards gala event” on Nov. 14 of this year. Presumably that event will be mentioned/excerpted at the Oscar ceremony itself, in the manner of the dreaded technical awards recap. But still, how embarrassing. Maybe when they run the montage of the year’s deceased movie folk, they can play the Benny Hill music (“Yakety Sax”) as accompaniment, too. The winners are deserving: Lauren Bacall, Gordon Willis, and Roger Corman. Exec John Calley will get the Thalberg. The Thalberg would’ve seemed the obvious choice for Corman, actually, since it goes to producers, but I won’t argue with the Academy being a little generous to the greatest figure in the history of exploitation (undoubtedly his track record as nurturer of young talent will be prominently lauded). Willis is a defining cinematographer of his generation, although his award is a reminder that the clubby nature of the Oscars kept him out of being nominated during his astonishing period in the 1970s (yep, no photography nominations for the two Godfathers, All the President’s Men, or Manhattan – gag). 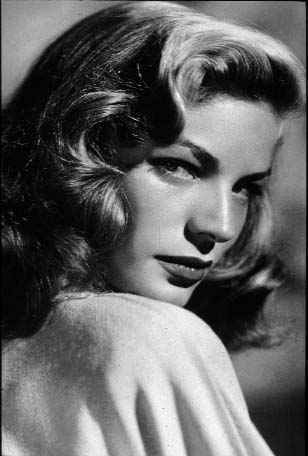 Bacall is an obvious choice, no complaints there, even if her actual filmography is overloaded with middling titles. She’s still a tie to a vanished kind of Hollywood, and she deserves extra points for having worked with Lars von Trier and Paul Schrader while in her eighties. It would all make for a very nice Oscar ceremony, except that apparently it won’t. And I’m still annoyed about them giving Jerry Lewis the Jean Hersholt Humanitarian award last year, instead of a proper special Oscar. Maybe this year they panicked at the thought of paying tribute to the director of Attack of the Crab Monsters in front of a half-billion viewers. Not realizing how cool that would have been. In the ill-starred filmography of Elvis Presley, Tickle Me has long been considered the lone instance of the King reaching out beyond a simplistic movie formula, and thus presents a fascinating case study for Elvis fan and serious film scholar alike. (To be sure, Girls! Girls! Girls! has its champions, but save that for another day.) Tickle Me was originally assigned to director Hal “First Take” Beauregard, who, despite his advanced age and unfamiliarity with post-World War I music, had already guided four Elvis vehicles to box-office success. Just before shooting began, Beauregard was taken off Tickle Me when it was discovered that he had been legally deaf and partly blind for the previous decade, a condition known only to himself and Presley’s manager, the legendary Colonel Tom Parker. This is where the saga truly becomes interesting. With only days until principal photography was scheduled to begin, Colonel Parker asked Lean for an inspiration. And Lean found one: Alain Resnais, the French director of Hiroshima, Mon Amour, which had exploded onto international movie screens a few years before. Resnais was in Hollywood hoping to jump-start his American career with an MGM horse-racing picture, but immediately leapt at the chance to work with the singer known in France as Le Roi du Pelvis. It was Resnais’ inspiration to enlist writer Alain Robbe-Grillet to punch up the Tickle Me script, which was originally penned by Ellwood Ullmann and Edward Bernds, a long-established writing team whose previous film was The Three Stooges in Orbit. One might expect Robbe-Grillet, widely celebrated for the 1950s Nouveau Roman movement as well as his superbly manicured fingernails, to look down on the assignment. Yet he relished the prospect of exploring U.S. culture from the inside. Later he was to recall the experience as a welcome break from the “excess of thinking” that marked his work in French literature. The end of lonely street. Because Resnais’ original cut of Tickle Me was never released, it deserves close description. 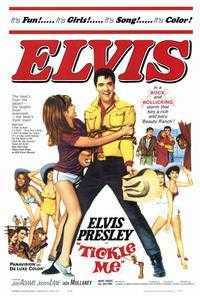 Elvis plays a rodeo rider known only as X, who travels to an all-girl dude ranch to work as the equestrian instructor. There he fends off the amusingly amorous advances of the lady ranch boss (leggy Julie Adams), while carrying on a romantic rivalry with the only other male at the ranch, a racecar driver/scuba diver/roustabout named Brad (Giorgio Albertazzi). X meets a woman called A (Delphine Seyrig), a bored socialite. In a series of enigmatic scenes, X and A wander the cold, drafty halls of the ranch house, puzzling over the question of whether they had met the previous year and arranged to meet again here at the Circle Z. He insists they had an affair at Marienbad, but later admits it may have Daytona Beach, or even Acapulco. Perhaps, he wonders, it happened at the World’s Fair. 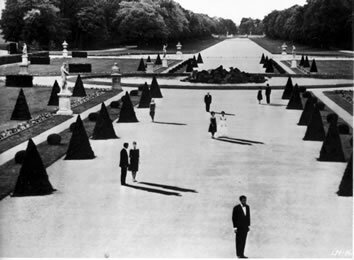 Characteristically, Resnais toys with our traditional notions of time; we are never entirely sure whether we are in past, present, or future. Even Presley’s physical appearance seems to bear this out: X is sleek and lively in one scene, bloated and dozy in the next. The stark flatness of the studio shooting, with its painted Arizona skies and cardboard tumbleweeds, anticipates Resnais’ future excursions into Brechtian theatricality, such as Smoking/No Smoking. Elvis’s habit of eating meatloaf and mashed potatoes at every meal amused his worldly director and leading lady, who tried to encourage the boy from Tupelo to sample the French cooking at Hollywood’s leading haute cuisine restaurant of the era, Le Petomane – to no avail. It may come as a surprise to film buffs that Elvis got along so well with Delphine Seyrig, the elegant, aloof queen of 1960s art cinema. He described her as “a real fine gal, very clean and polite,” and she later claimed to have based her performance as a reclusive, ritual-driven housewife in 1977’s Jeanne Dielman on her observations of Presley. At this point, some of you may have looked up Tickle Me on the Internet Movie Database, and wondered why veteran director Norman Taurog and Ellwood and Bernds are credited, but not Resnais and Robbe-Grillet. And here we must say that the eternal battle for the soul of cinema – Art or commerce? Prestige or box-office? Glen or Glenda? – rears its inevitable head. Allied Artists, desperate for cash after sinking most of their money into the expensive biblical flop Hotter Than Ninevah, needed the Presley picture to hit big. Veteran director Taurog was called in to shoot a new subplot, much of the Resnais footage was cut, and the song “Dirty Dirty Feeling” was added. The latter, although admittedly a kickass number, is an especially jarring note given the delicate, ghostly atmosphere Resnais had been trying to evoke. The French director, infuriated, returned home. 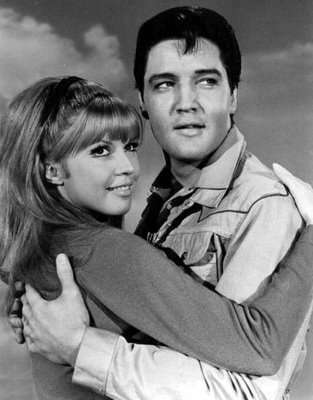 His interviews with the European press indicate that he was especially upset at the removal of Elvis’s karate scenes. Nevertheless, Tickle Me was released in 1965 and became Allied Artists’ third-highest grossing film ever. Elvis and the Colonel returned to their safe formula, although throughout his life Elvis maintained an affection for the products of the Franco-American food company – a suggestion, perhaps, of his lingering affection for French culture. And the real Tickle Me, the film that might have transformed Presley’s career into something more than inane musicals, was forgotten. Until now. We owe a great debt to Turner Classic Movies and Canal Plus for the restoration of most of the Resnais footage. (There is no truth to the canard that Ted Turner wanted to colorize the film until he learned it was already in color.) Some of the missing reels were discovered in metal cans in a dairy in Tillamook, Oregon (by happy chance, nitrate film stores exceptionally well at the same temperature as Muenster cheese). Except for the smell, they were in superb condition. Another print, nearly full-length, was unearthed in a prison library in Budapest, where it had entertained inmates throughout the Cold War. Thanks to the miracle of computer imaging, the Hungarian subtitles have been digitally removed with virtually no loss of picture quality. The resulting film, which Resnais has dubbed Tickle Me Redux, debuted at the 2009 Cannes Film Festival to a fourteen-hour standing ovation, and will bow on the Turner Classic Movies channel on the anniversary of Presley’s death. The Film Society of Lincoln Center will feature it in their upcoming program, “Alain et Elvis: Studies in the Phenomenology of Time,” a collection of 25 films on the theme of Resnais and Presley. Finally – inevitably! – a DVD box set will be released for Christmas, with three cuts of Tickle Me (original release, Redux, and Hungarian), full letterboxing, and a commentary track by Resnais and longtime Tickle Me booster Quentin Tarantino. Tragically, the karate footage has been lost. The Turner Classics website still carries the “Brief Synopsis” above for their entry on Tickle Me. Check it out here, but please don’t tell them to correct it. This piece is co-published at Parallax View.